Seems only yesterday we were talking about the beginning of summer, but today the school buses are rolling and we are anxiously awaiting the arrival of a number of new autumn designs. We are anticipating arrival of four newbies from Cecilia Turner at Heart in Hand. Everyone has been waiting for Bird in the Hand: Autumn, which is the final installment in the set of four seasonal Bird in Hand designs. 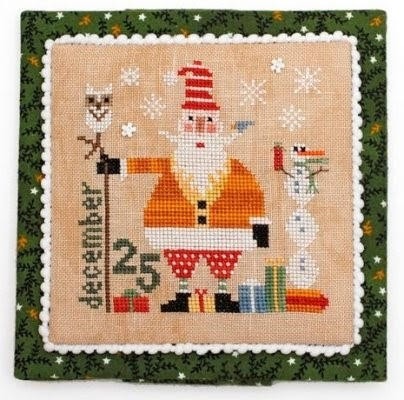 These designs are great stitched alone or joined and finished using a free border available from our shop. Please see photo showing the entire set stitched together. Also from Cecilia is Harvest on Dahlia Ridge where a lovely maiden has yielded quite a harvest – super-sized dahlias and pumpkins galore to gather. 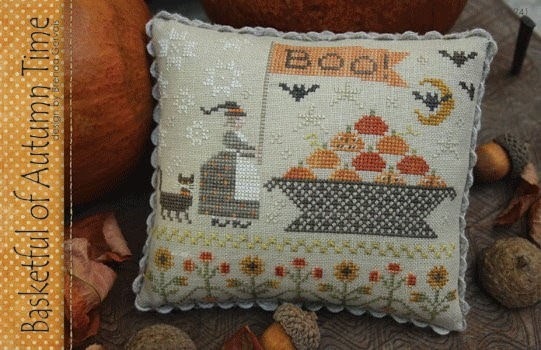 Delightful wooden pumpkin buttons are included with each chart. Wee Santa 2018 is coming along in this shipment. 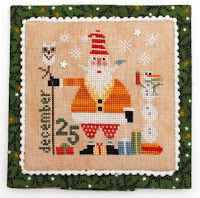 The 23rd annual Santa celebrates the jolly old elf’s cold weather home as Santa is joined by a snowman, snowy owl and a tiny bird perched on Santa’s mustache. A must have! 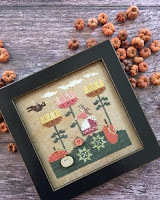 Brenda Gervais has also been working on a number of new autumn creations: Bittersweet & Broomsticks features a darling little witch with her basket of pumpkins and, of course, bittersweet branches. Next comes Basketful of Autumn Time; the third in a four-part seasonal series. 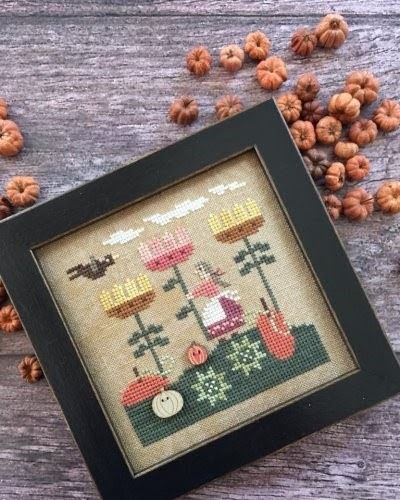 This chart shows another little witch carrying a BOO banner over a basket filled with pumpkins surrounded by flying bats. 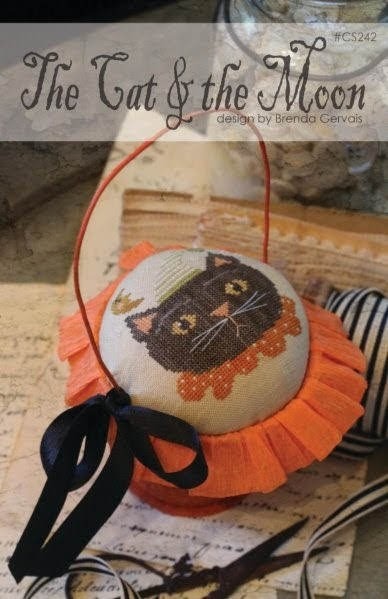 The Cat & the Moon is the 3rd basket in the gardener’s peat pot series. Cute, cute cat in this chart. A must see! 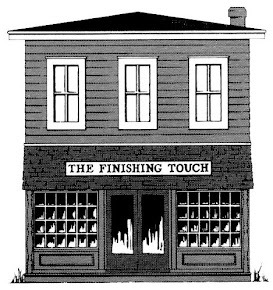 The designs mentioned above are just a drop in the bucket of new things in the shop and on the road here. Please stop to see for yourself. If you have not seen the latest Plum Street animal collection (Hen Peck, Cow Pile, Snort Stack and more), it is whimsical and just plain fun. 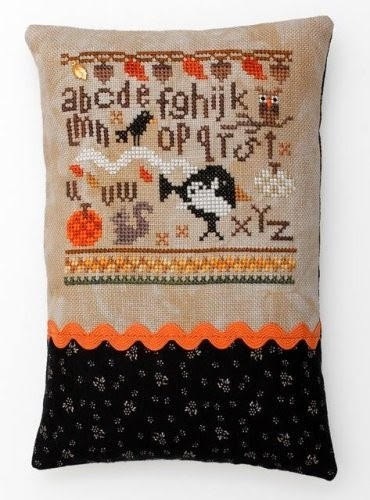 The 2018 Just Cross Stitch Halloween book is here and the Christmas book should be here shortly. Sounds like a very busy stitching season.